When an appliance like F5 NLB becomes default gateway for some L2 BD you need to enable flooding in that DB because you need flooding on all BDs which have an outside appliance mapped to them (for ARP packets to get from the outside appliance to VMs and vice-versa). IP unicast routing can be disabled on that BD because with no L3 point in ACI (no subnet configured on BD) the possibility for ACI to do “smart” bridging and routing of that traffic is lost. ACI will not learn IP addresses of endpoints (VMs) in that bridge domain nor it will do anything more for that traffic than normal L2 switch would do. He will only know MAC addresses and bridge the traffic towards F5 interface which will respond to ARP when some endpoint sends an ARP request asking for the default gateway. On the other side, when your datacenter has L3OUT connection to the outside world (in order to be able to receive traffic from clients on the Internet or somewhere), you are in a situation that all ACI learned subnets (ACI datacenter network segments or BDs with L3 configured) can be advertised outside through L3OUT. 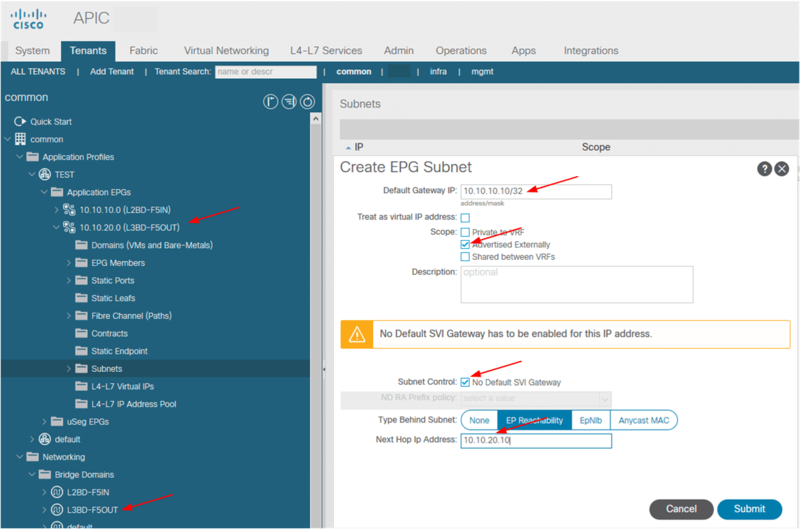 On the other side, endpoints in L2 BD segments (like VMs in L2 BD behind F5 NLB appliance in subnet 10.10.10.0/24 in our example) will not be learned by ACI and they will not be advertised outside even if we configure that DB to advertise outside (because ACI is not aware that some IPv4 or IPv6 addresses exist in that BD). 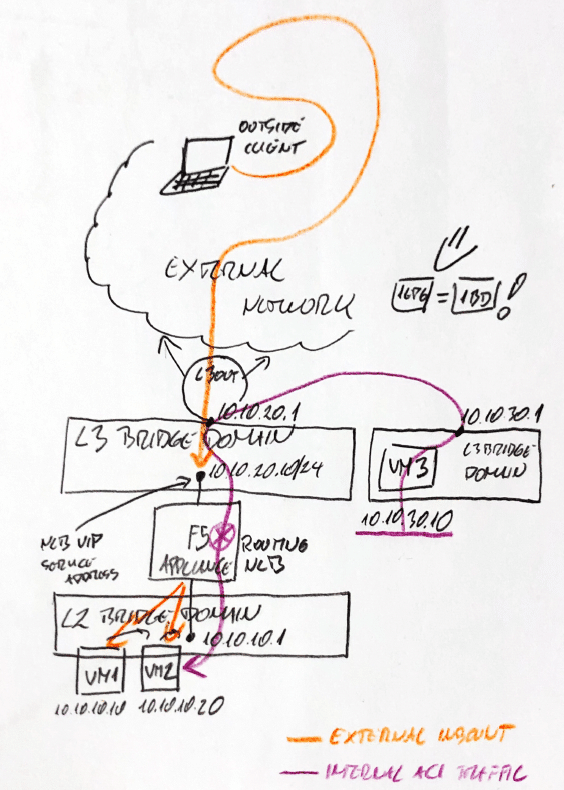 For our L3 BD (F5-OUT 10.10.20.0/24) NLB’s outside interface IPs (SelfIP or VIP IP), ACI will know they exist and will be able to route towards them from any point in ACI Datacenter. If we configure F5 device to load-balance some service that is running on VMs in L2 BD (VMs 10.10.10.10 and 10.10.10.20) that service will become available on a VIP address from 10.10.20.0/24 subnet as a VIP address and it will be reachable from ACI fabric and advertised outside ACI if so configured for that L3 BD. We are talking about orange traffic flow from the image above in case you are wondering. When administrators request direct access to those same VMs behind NLB for administrative operations, they will want to access those VMs by their own IP and not VIP address on NLB (VIP address on NLB receives traffic for some service and load-balances that traffic towards more VMs behind in server pool). One of the reasons could be that by accessing VIP, you are not sure on what VM you will end up. okay okay, you can control that on NLB device but we need direct access to VMs for administrative reasons to work all the time without the need to touch NLB config every time. F5 needs to be additionally configured as a forwarder in order to enable any IP traffic to get to those VMs by acting as a router and not load balancer. The thing is, those IPs are only learned and known inside ACI and are not advertised outside 10.10.20.0/24 BD even when that BD has “Advertise Externally“ routing setting enabled. We have an option to solve that by generating host routes inside EPG that represents F5 outside BD with IP addresses of those endpoints which will then (with defined proper next-hop to NLB appliance outside interface) be advertised outside ACI datacenter effectively enabling inbound traffic to get the information where to send the traffic to in order to get to the VMs in question (10.10.10.10 and .20). When configuring host routes to those endpoints (in L2BD-F5IN) we need to configure host routes under outside EPG (L3BD-F5OUT).